Waaahhh.. milk all the time? But that “moo” response IS funny! Hahaha! hehe…zaria’s getting smarter, know wht she wants already and ready to “beat” too. she’s one already right?! I have one at home too. 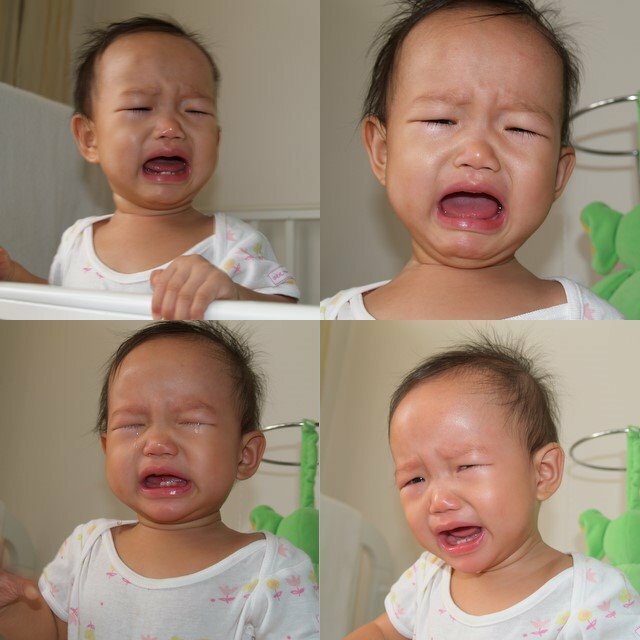 How about we put our kids together and see if they can synchronize cry at the same time???!!! Really la…so kesian…and you can snap away with your camera..lol! altho this post is not about how cute Zaria is but she still can make us laugh with her “moooo”….. and still look such a cutie! The flashing of her teeth as she smiles is so cute. So far I thought it is only my JE that bangs the head on the floor in tantrum, looks like Zaria does that too. She must be so angry that you are snapping the photos instead of picking her up. what a good shots…..both laughing (good) & crying (notti)!! but isn’t the sight of seeing her went on four & banging her head on d floor so heart wrenching??? i would have pick her up lor…..
poor girl….& also poor moo moo!! though she’s crying but still very cute! wah…like a drama queen eh? She looks very much like her daddy. I always thought Zaria is easy going. I guess it’s a necessary stage kids go through. On the bright side, it’s normal. such big drop of tears huh? Still look cute. Zaria looks like her daddy, and also Zara (esp when drama starts!). Here’s wishin you & your family a blessed Christmas & a great start to the new year. Perhaps project no. 3? alamak ppl crying away this mama take her pics n walk away pulak! hahahaha…moooooo..i oso wan milk milk…. Lets hope the panda period is just for a while. Not sure why every baby starts the clingy period after recover from sick.